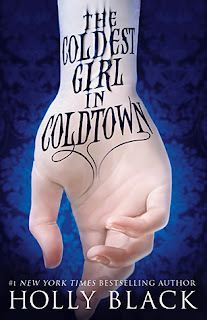 Synopsis: "Tana lives in a world where walled cities called Coldtowns exist. In them, quarantined monsters and humans mingle in a decadently bloody mix of predator and prey. The only problem is, once you pass through Coldtown's gates, you can never leave. I was so impressed with this book, and I did not expect it I would consume it so quickly. I immediately fell in love with Holly Black's writing style. I loved how even though we had this one story line, she was still giving us background on multiple different characters. Every other chapter was background through flashbacks but none of them felt forced. They were told in a beautiful way that slowly reveled new pieces of the story. Tana was so wonderful. It was so easy to connect with her because even though was she given a rough past and a bad home situation, she still fought to keep her family safe. I gained so much respect for her when she made the choice of going to the coldtown even though she was unsure if she was infected or not. I was not a huge fan of Aiden. He was just kind of blain, and the only thing that really stood out in my mind about him was how weak willed he was. I also didn't like how Midnight and Winter were both such gender neutral names. I wouldn't have cared as much if they would have been the main characters because I would have been able to distinguish which was the brother and which was the sister. There was one scene in the book that I couldn't tell which twin it had affected because I couldn't tell which was which. I didn't really care for them. I loved that this story was open ended. I usually hate that about a book, but with this one I loved it. I liked how you can make your own ending. I like how you have this option for the world that Tana and Graviel are in because in the world they live in they don't have it. I just like how many things could steam from it. My favorite moment in this entire book is when Tana has locked herself in this basement, and is putting herself into quarantine. The moment the chains where coming undone I knew it Graviel coming back to her. I knew that the story couldn't end with her just walking away from him because in YA there always has to be this romantic love interest, but the way this one ended did things to me. "Oh, my sweet Tana. Remember that I am still a monster. I can listen to you scream and cry and beg and I will still won't let you out." This was amazing because it did not make him seem romantic. It showed he was a monster, and I loved it. I also loved how they both accepted there was a possibility that Tana couldn't go back, but if she couldn't they would hunt vampires together because she would rather stay cold than become a vampire. So glad you enjoyed the book! It was one of my favorite reads in 2014 and ohmygod that quote!!! Yass, one of my favorites. I love that quote! I just ate it up! I can't wait to read more by Holly Black! I have this on audiobook and I just can't wait to listen to it! And yess I loove Holly Black's works!